The purchase process as we know it hasn’t changed. People still need to learn, shop and get support. But through new avenues of digital and human interaction, this process has become more social. Consumers are relying on a community to inform their decisions at every step. Communities have become trusted advisors, and brands have evolved to become facilitators within those communities. Together, the communities and brand facilitators not only help consumers to learn about products, but also to shop and provide support. This socialization has opportunities and challenges for brands. On one hand, a social brand experience creates a trusted environment that benefits the brand with more likelihood to purchase. On the other hand, this environment can also expose any flaws in the brand experience across any touch points. Businesses have the option to socialize different stages of their purchase process: learn, shop and support. To see how this works, lets look at three brands in the baby category: BabyCenter, Giggle, and Babies “R” Us. Being a new dad, I’ve had the opportunity to experience these brands first hand. BabyCenter is the place to go to learn about all about babies. They have a vibrant community for different types of people, e.g, first time and second time parents. They have a robust set of frequently updated articles. BabyCenter functions as an education and support resource. 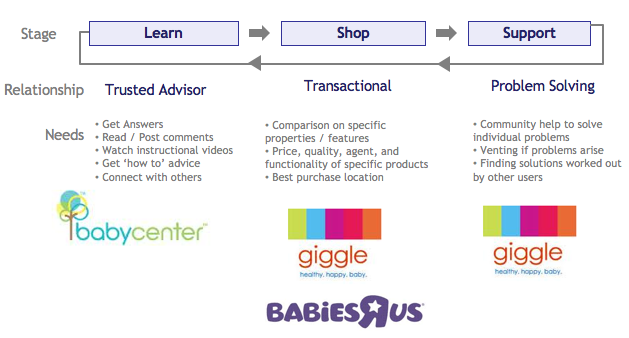 In my opinion, Baby center is the market leader for learning. Giggle, on the other, is a great place to shop and get support. I like their curated selection. I love their store design, which feels more like a nursery and less like a shop. The best part is that when you go to the store, the people are all highly trained and capable of answer all your questions about a wide range of baby care issues and products, from bathing to traveling. They play the invaluable role of problem solvers, helping confused parents through the whole process. They have also socialized the shopping and support stages, enabling consumers to rank, review products and provide advice. While it might not be fair to compare Giggle with Babies“R”Us, Giggle is probably the leader for customer support among baby retailers. Finally, Babies“R”Us is a frustrating shopping experience for new parents. While they have a broad selection, they provide very little support in the store. It feels like a Walmart for babies. But unlike at Walmart, Babies”R”Us does not offer lower prices versus Giggle. For instance, a Graco Direct Connect monitor with two receivers costs $89.99 at Babies“R”Us and $90.00 at Giggle. Babies“R”Us has also socialized the shopping process. The problem is that Babies“R”Us is not delivering on service. As a result, Babies“R”Us might be the market leaders in “shop”, but not in “learn” or “support.” This also does not necessarily translated into higher profits. In conclusion, the socialization of the purchase process has redefined the way we look and analyze the band experience. Brands had the opportunity to play different social roles; a trusted adviser, problem solver or just a place to shop. A trusted advisor and problem solver tends not only to gain your mind share, but in the long run it also has a strong influence on you share of wallet. ​Thanks for visiting!! I am a student of our digital society. I like to analyze how brands can help solve the social and economic issues that are affecting our community through digital innovation. The opinions expressed on this site are my own and do not necessarily represent those of my employers. How much are your “friends” worth online?